The best carry on bag for a woman will consist of several key items. With airline luggage costs rising, more and more people are opting to carry all of their luggage onto planes with them. This is a great solution, as it prevents the loss of luggage and saves you a ton of time at baggage claim. But which carry on bag the is best? Which is the best carry on bag for a woman? Many women have different needs. Extra pockets for toiletries, protection for undergarments, and even extra space for a variety of shoes are all important for many women, especially women who travel for business. There are so many on the market that it can be difficult to decide which option will work best for you. Things like business vs. vacation travel, different airline carry on restrictions, and whether you prefer to wheel or carry your luggage can influence which bag is right for you. Below we have listed six options that we consider the best carry on bag for a woman. As a female traveler always on the go, I considered factors that have made an impact during my own travels. In choosing these bags, we took practicality, function, and style into consideration. So take a moment to reflect on what kind of traveler you are, and go ahead and choose whichever carry on bag or backpack on this list is right for you. Good for: business travelers, longer vacations. This is a great choice for women. It is small, sleek, and super lightweight, so lifting it over your head to pack into an overhead compartment will be nice and easy. The hard-shell ensures that it will slide into a trunk or an over-head compartment easily, without snagging any exterior pockets. The four spinner wheels ensure that it is easy to pull alongside you through the airport. This bag all no-nonsense function. It makes it a great choice for the seasoned traveler who wants to get on and off of the plane quickly and efficiently. If you are looking to standout from the crowd during your travels, then you absolutely cannot go wrong with this retro pleather bag. The mod style is reminiscent of the 1960s, when flying was a stylish luxury. The vegan leather offers a classic, expensive look without the cruelty, and the addition of 4 spinning wheels makes the entire fashionable piece practical. It will be easy to wheel through the airport and even easier to identify in a sea of black and grey hard-side carry-ons. It comes in four unique colors and styles and practically guarantees a few compliments. 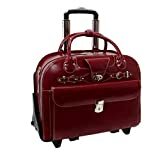 The vintage look is why it is one of my favorite best carry on bag for a woman options on this list. Good for: Quick weekend trips, budget airlines that charge for overhead bin space. This bag is great for anyone looking to maximize their packing space in nothing more than a personal item. This bag measures 18.5” x 13.3” x 7.8”, which means it fits within almost every airline’s personal item size allowance. However, it also comes with large, roomy compartments. Simply put, this best carry on bag for a woman option offers a ton of packing space. It features a separated, foam-padded laptop sleeve, a large main compartment for your clothes and shoes, and a smaller front compartment for your accessories. It also has adjustable, padded shoulder straps for optimal comfort. This backpack comes in neutral colors to match any travel outfit you choose to wear. This is a fantastic, practical choice in travel backpacks. If you don’t want to be mistaken for a student at the airport, and would rather opt for a more stylish bag that can still be slung over your shoulders, then you should purchase this beautiful leather backpack from Polare. The classic, caramel color and synched top closure is both vintage and classic. Plus, it will match absolutely any outfit you pair it with. It features a large main compartment, which can fit a 14” laptop along with a few outfit changes. This lovely backpack also has three large exterior pockets that are great for storing toiletries and accessories. With this bag on your back, you will be the envy of everyone else in the terminal. Good for: anyone who does a combination of business and pleasure travel, who can be gone for any amount of time, and likes to have a variety of luggage choices. This bag can be worn as a backpack, wheeled behind you like a roller bag, or even held by your side like a duffle bag. This is a fantastic choice for anyone who wants to use the same bag during business drips that they also use hiking. It is versatile, spacious, and a fantastic choice for anyone who is going to be lots of different kinds of travel. One European traveler extols the virtue of the bag’s flexibility in their review, saying they were able to take it on several flights without a problem. It fit in the overhead storage, even though she had packed 2 weeks worth of clothes — and she still had space! She also said it was easy to roll around different terrains, including cobblestones. When it came to stairs, she simply used it as a backpack and carried it about. This bag looks like a classic over-the-shoulder briefcase, but can easily be wheeled behind you at an airport. If at any point it becomes inconvenient to have the bag on the floor, the wheel apparatus can be removed and the entire thing can be balanced at your elbow or held by your side like a classic bag. It comes in nine bright and vibrant colors. You can pick whichever choice best speaks to your personal style. This bag is both aesthetic and functional, a making it a great convertible choice for any frequent traveler. This is one of the best carry on bag for a woman options for a short trip. 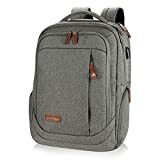 What is the Best Travel Backpack?